Phenomenological Engagement with the Living World. Nature around us is whole and interconnected. Though we are part of nature, we do not yet fathom her depths, and our actions do not embody her wisdom. A fundamental shift in our way of viewing the world is necessary if we would contribute to nature’s unity rather than [to her] dissolution. 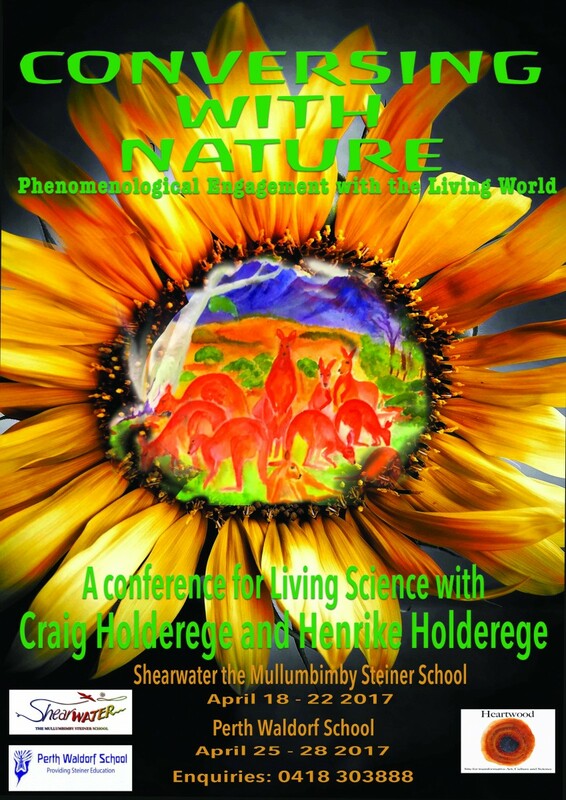 Convened by Heartwood, in association with Shearwater, The Mullumbimby Steiner School and the Perth Waldorf School, Conversing with Nature; Phenomenological Engagement with the Living World, will be led by research scientist, author and international lecturer, Dr. Craig Holdrege, and mathematician, Henrike Holdrege, of the Nature Institute, Ghent, US (natureinstitute.org/). As keynote speakers and course presenters they will introduce participants to ways of thinking and perception that integrate self-reflective and critical thought, imagination, and careful, detailed observation of nature’s phenomena. These five-day intensive seminars provide an opportunity to explore our contextual relationship to nature and technology. Both Craig and Henrike are Steiner educators with extensive experience in Germany and the US. A faculty of experienced Australian scholars, educators and artists will support them in presenting the theme and, using artistic and scientific approaches, will provide a creative, in-depth and immersive encounter with a phenomenological based view of the natural world. The conference will focus on the needs of educators, and people of related fields, engaged with age groups from Early Childhood to High School, who seek a new way of seeing that shares and communicates a living and meaningful experience of the natural world to children and young adults. All Inquiries: Heartwood – konradkorobacz@mac.com.